For breakfast I had the Gallo Pinto (traditional black beans and rice) with cheese, a plantain, fried eggs, and a tortilla at the Tortuga Lodge just outside of Tortuguero village. I thoroughly enjoyed all of it except the cheese (I’m not sure what kind it was, but it wasn’t my favorite.) I paired the meal with mango juice. Lunch was also at the Tortuga Lodge. I ordered a veggie wrap with fries that came with a fresh salsa. I devoured every bite. After a day of hiking and exploring, we also ate dinner at the lodge. I ordered a beet salad (below), but I had some of Graham’s sea bass, too. We skipped breakfast because we went on a river boat tour on the Tortuguero canals. I ate a breakfast bar that I had brought in my luggage from the U.S. Lunch was a snack plate of jalapeño poppers and a salad. Also bread; lots of bread. 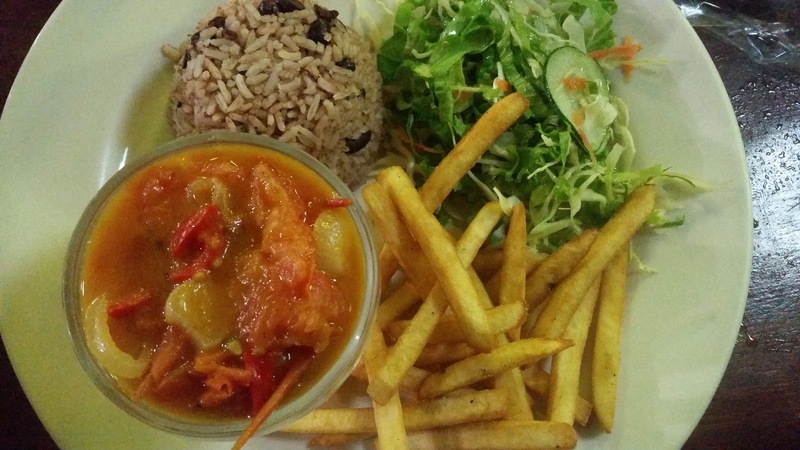 We went into town for dinner at a Caribbean restaurant. I wish I remembered the name, but it’s to the left on the main path through town. It has lots of Jamaican decor and played Bob Marley music loudly from its speakers. (The town is so small that this vague description would probably help you find it.) I had papas bravas (not pictured) and plantains with black bean/salsa dip. The spicy potatoes came with a house salad. Graham had a chicken rice and salad and non-spicy potatoes. I mention this because I ended up also eating his salad and potatoes. Breakfast was Gallo Pinto again (see above) with no cheese at the Tortuga Lodge. I also ate some fruit and yogurt from my husband’s plate. We were on the go at lunchtime so I only ate snacks. 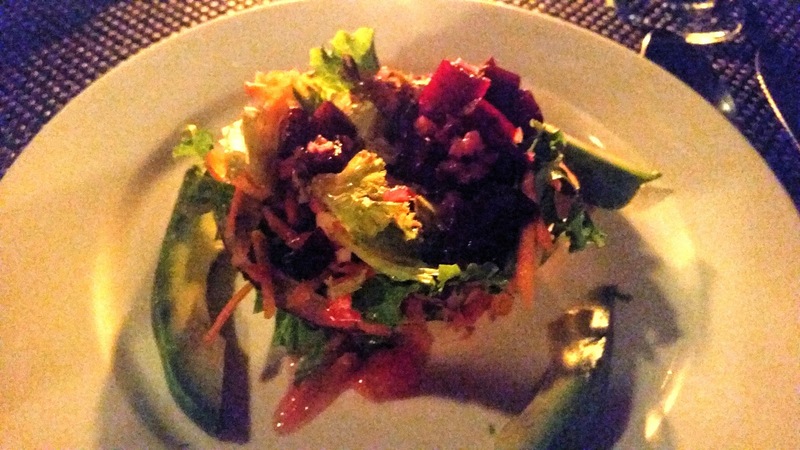 Dinner was an amazing meal at La Pecora Nora in Cocles near Puerto Viejo. It’s an amazing Italian restaurant that’s worth the splurge. *Excuse my cellphone photo; I didn’t have my camera with me. The meal came with a lentil soup starter for free, as well as lots of bread. I ordered a penne arrabiata that was delicious. 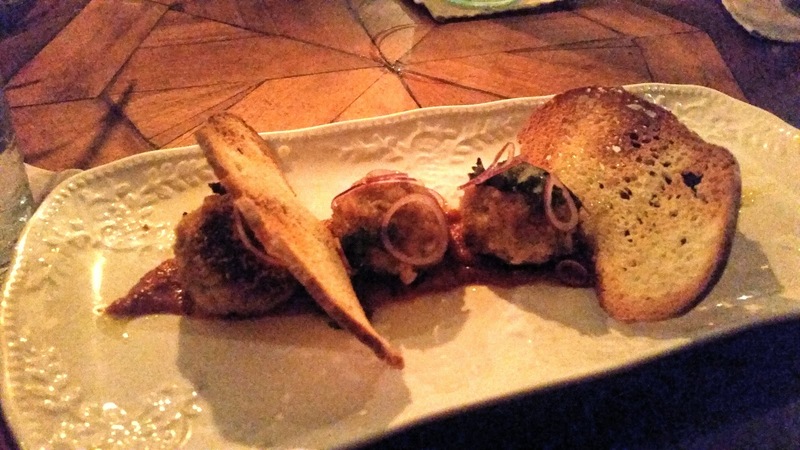 We also had a tasty tuna meatball starter. Graham ate a fish pasta that also was incredible, though I can’t recall what kind of fish it was. 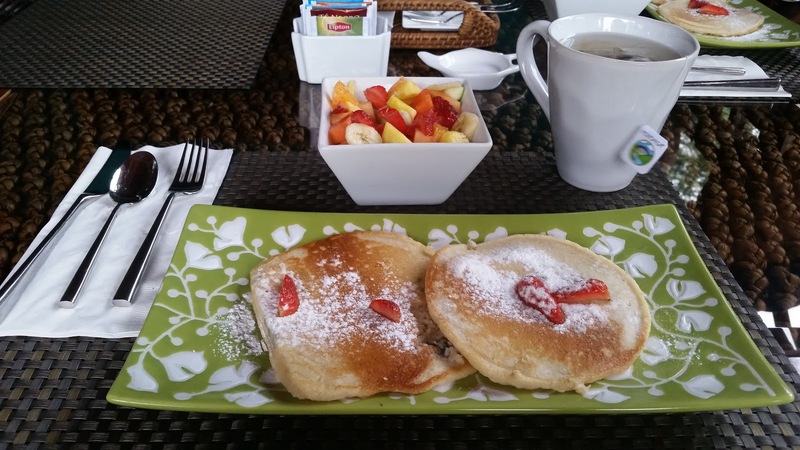 Breakfast was pancakes with fruit at Physis Caribbean Bed and Breakfast in Cocles. 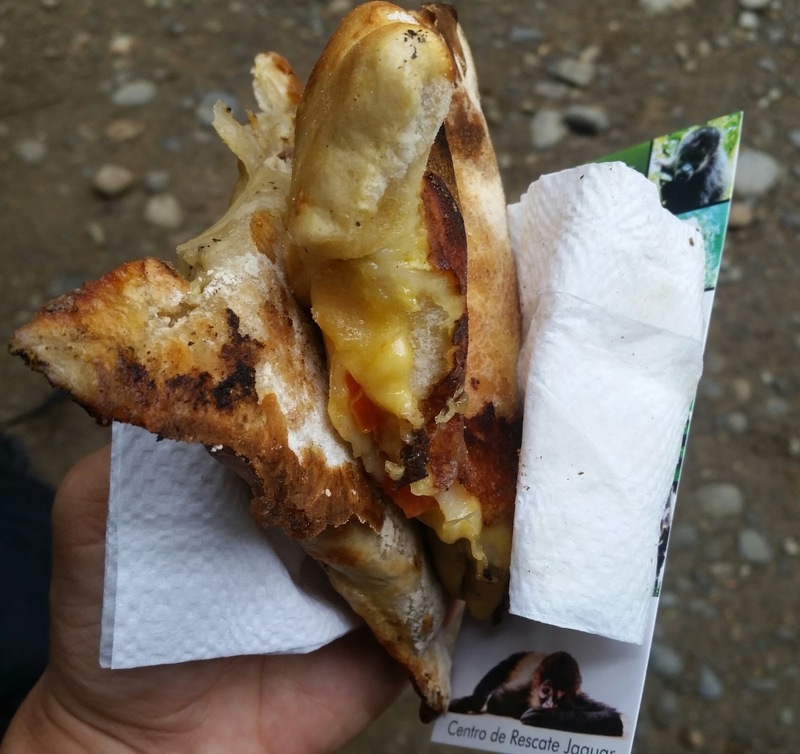 Lunch was a cheese, basil and tomato empanada we got outside the Jaguar Rescue Center in Playa Chiquita. It was the best empanada I’ve ever had and only cost $2. 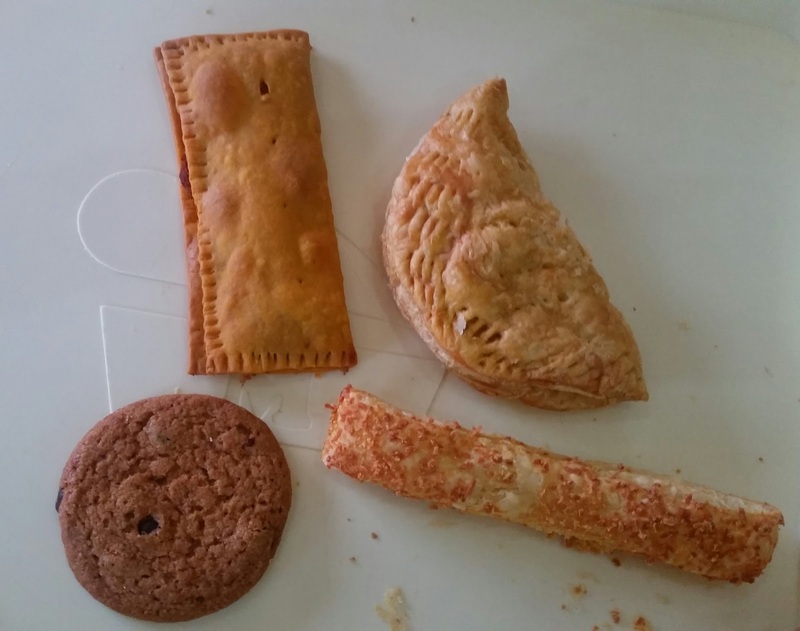 Also pictured is a chicken empanada (not mine). Dinner was margarita pizza at an Argentinian place in Cocles, next to the Super Cocles. It was huge. Breakfast was eggs, toast and fruit at the B&B. Simple but effective. Lunch was snacks and a spinach empanada that wasn’t nearly as good as the one I had the day before. Dinner was the vegetarian plate at Soda Johanna’s in Cocles. It was delicious. I especially enjoyed the Caribbean salsa. 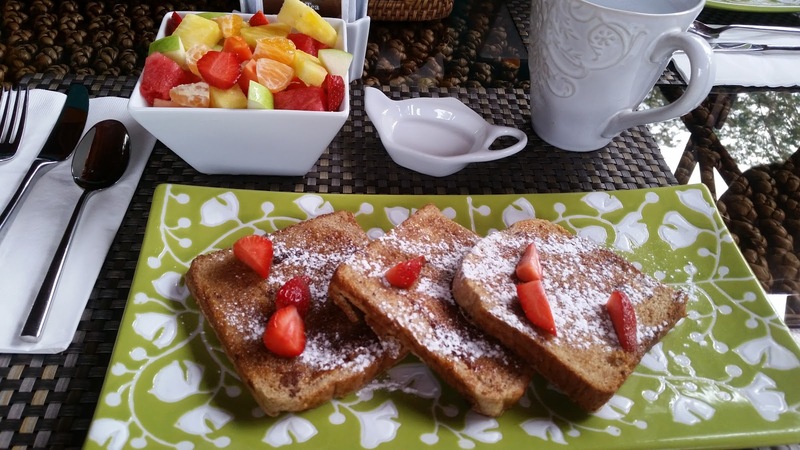 Breakfast was French toast with real Canadian maple syrup and a fruit cup. 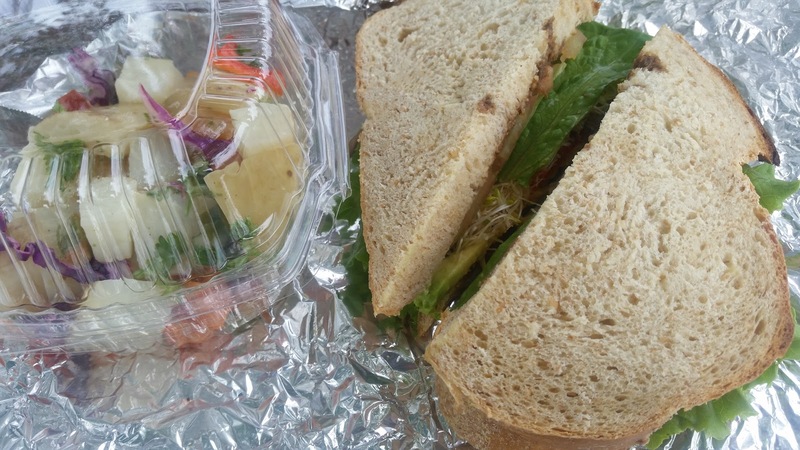 Lunch was a veggie sandwich and potato salad from Bread and Chocolate in Puerto Viejo. It was a little pricey but good. ($22 for two sandwiches with sides and two drinks) We took it to go on our way to Cahuita for some hiking. Dinner was sushi at Chile Rojo in Puerto Viejo. We weren’t really that hungry but knew we should eat something. We washed it down with piña coladas. A musician from Chile played while we ate. He had the most beautiful voice. 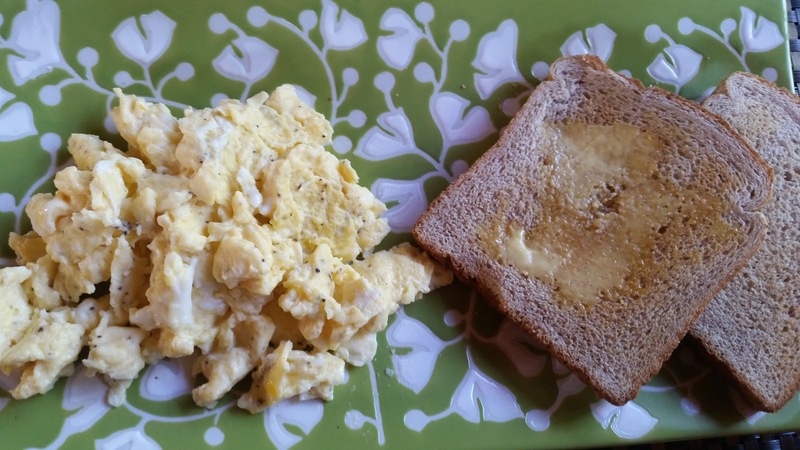 Breakfast was gallo pinto, eggs, toast and orange juice before our river rafting trip. Lunch was a make-your-own-bean burrito, pineapple slices and a cracker with jelly. Dinner was a cheese empanada we got on the go. Breakfast was assorted savory and sweet pastries from a local bakery. Lunch was snacks on the go again: more jalapeno poppers and fries because I couldn’t resist the junk food. Dinner was spaghetti (not pictured). As you can see, I didn’t make the healthiest eating options, but damn were they great-tasting. *We had two other half days but I am only recounting full days in Costa Rica. When you travel, are you good about eating the same foods you would at home or do you like to try new things? Do you choose healthy? Junk food?